On New Year's Day I took up the challenge issued by crochet supporter and good friend Laura Krzak, and spent part of the day making a chemo cap to donate. I chose Halos of Hope because the president, Pam Haschke, had done a really interesting episode of Getting Loopy with me - you can hear it here. I grabbed a skein of pretty blue LB Collection Cotton Bamboo from the stash and a G/7/4.5mm hook and went to town. I also used an F/5/3.75mm hook for the single crochet edge. For those of you who asked when I tweeted pix (I am @Hooked4Life), I didn't use a pattern but quick made one up. Here it is, in one size. If you wanted to quick size it up, you could use a bigger yarn and hooks, or add 1 sc to the first rnd which would add several stitches to the finished brim as you increase for the crown. I got about 3.75 dcs to the inch in dc, the cap as 17" around unstretched (I wanted it small since bamboo grows and Pam said smaller is better than larger) and about 6" in height from the end of the crown increases to the edge of the brim. I used well under one skein of yarn. I don't know that I could get two whole hats from one skein but there is a lot left over. Ch 4, join into a ring with sl st in 1st ch. Rnds 7 - 19: Ch 3, dc in each dc around. Join rnd with sl st in top of beg-ch. 70 dc. Rnds 20 - 22: Change to F/5/3.75 hook. Sc in each st around. I did not join the rounds but worked in a spiral so it would be neater. End off. With larger hook, ch 6, join into ring with sl st in first ch. Rnd 3: (Sc, hdc, 3 dc, hdc, sc) in each ch-3 loop around. Join rnd with sl st in 1st st. End off. 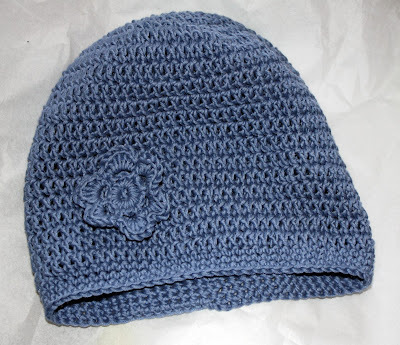 Attach flower to hat carefully so that your stitching is mostly on the outside of the hat - we don't want bumps inside! Weave in all ends. If you have pets or the yarn is as all musty, wash it in UNSCENTED cleaner like Soak before you send it! Happy New Year to you all - enjoy this pattern, and please consider making one to donate to the charity of your choice! This pattern is my New Year's gift to you, but please don't steal it, sell it, print two billion copies, or generally be a jerk about it. You may absolutely link to this post from any blog or forum. Thank you.